Speaking of weddings, let’s talk wedding cakes. I have had the horror honor of making two wedding cakes and three groom’s cakes in the recent years. As much as I love baking (and everyone loves my baked goods! Shhh! Can you hear that horn tooting! ); I do not have the patience to creatively decorate said baked goods. So when I came to making these wedding cakes let’s just say I was not the nicest person. In fact I might have said some choice words in a mean voice to certain loved ones (mainly Eric) when I was responsible for these wedding cakes. Just putting the word “wedding” in front of cake totally took all enjoyment out of the cake baking/decorating process for me. And actually made me hate it. It made my stomach churn, made me sweat profusely, lose sleep, and probably half a head’s worth of hair. But I guess the look on my friends and sisters’ face is priceless when they see the cake especially knowing how much it helped all of them with their tight wedding budget. All that blood sweet and tears that went into those damn cakes was worth it. 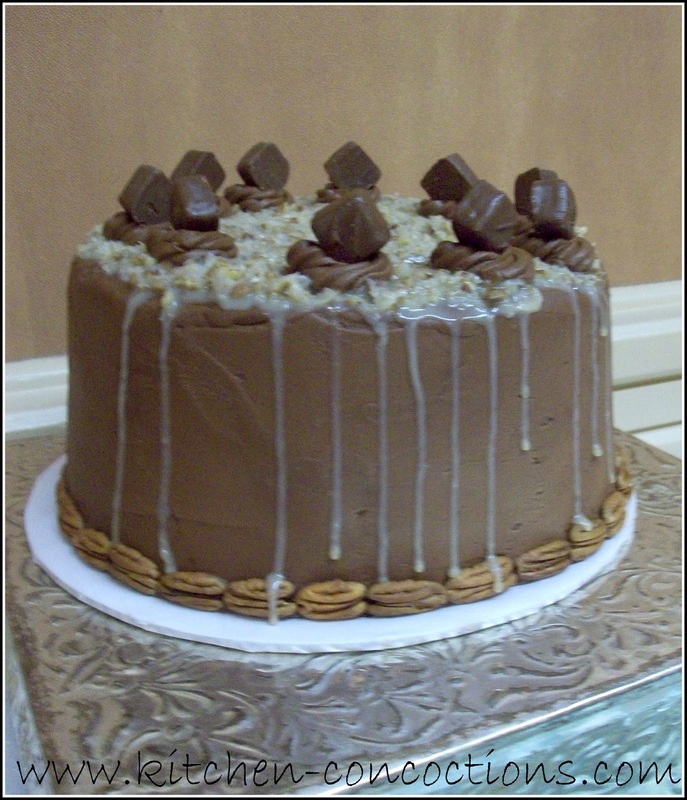 This German Chocolate Cake was made for the groom’s cake for my friend’s C and V (this same friend). She was having a whimsical candy themed wedding and so I made a triple tier cake and then cupcakes. I actually thought it turned out wonderful despite the coconut frosting dripping down the side in the hot and humid Texas heat (and the bride and groom and guests actually thought that was a cool decorating trick I pulled off, HA! I fooled them!). Mini Snickers and Milky Way bars, as well as pecans, were the perfect toppings for a candy themed wedding cake! And here is another little secret. This cake was a doctored cake mix and no one even knew! I had planned on making the whole cake from scratch but after one tier made from scratch collapsed I felt I didn’t have time to continue that made from scratch BS and went the semi-homemade route (did I mention I was also IN the wedding). Anyways, this cake was amazing and one I will make again in another less stressful situation. Oh and sorry for the bad pics. I was under stress and forgot to take any pics until we got to the venue. I guess I could have taken pictures in the car but I was too worried about breathing on the cake and Eric’s erratic driving. But trust me this cake is killer (you know with all that blood, sweat, and tears)! Spray 2 (9-inch) baking pans with flour no-stick cooking spray. Combine cake mix, milk, 3 eggs, oil and sweetened condensed milk in large bowl. 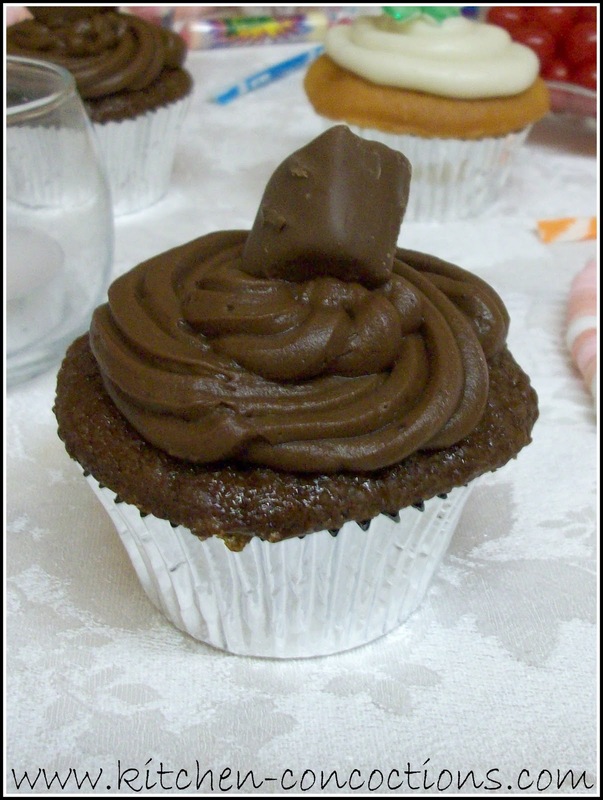 Beat on low speed of electric mixer until moistened, then beat on high speed 2 minutes. Pour into prepared pan. Bake 35-40 minutes or until toothpick inserted near center comes out clean. Allow cake to cool completely. Remove cooled cake from baking pans. Level off cakes. Spread half of prepared coconut pecan frosting on one layer of cake. Top with remaining layer of cake. Frost sides of cake with chocolate buttercream frosting. Top cake with remaining coconut pecan frosting. 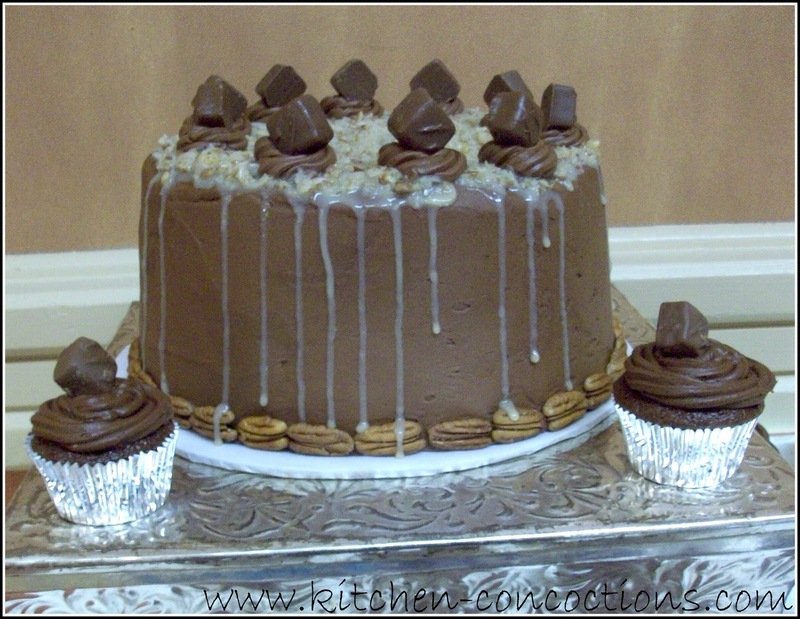 Decorate frosted cake with pecans and mini candy bars. For cupcakes: Bake for 18 minutes. Cool completely and ‘inject’ coconut frosting into center of cupcake using pastry bag with large open tip. 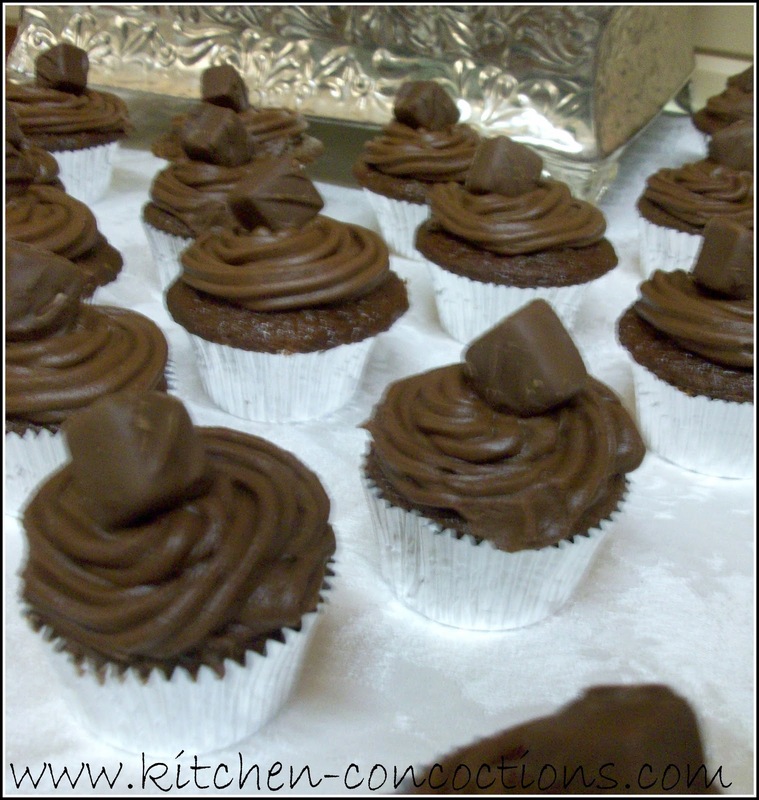 Top with piped buttercream frosting and pecan or chocolate candy. Stir together sweetened condensed milk, egg yolks and butter in medium saucepan. Cook over low heat, stirring constantly, until mixture is thickened and bubbly. Remove from heat; stir in vanilla, coconut and pecans. Cool to room temperature. Cream the butter, vanilla and almond extract. Slowly add the cocoa powder and powdered sugar one cup at a time alternating with the milk, mixing until desired consistency is reached. « It’s my party and I’ll cry if I want too.